EAST VILLAGE — Despite growing up in the birthplace of hip-hop, Bronx resident Ronalda Livingston traveled all the way to Germany to learn more about her borough's biggest export. "It was a mind-blowing experience," said Livingston, now 21, of her first-ever overseas experience, a visit to Berlin in 2010. "I have grown so much since the trip." Organized through the East Village-based Travel Agency of Change — which uses hip-hop and cultural exchanges to positively influence mostly at-risk youth — she met other young people who, like her, saw the art form "as just a way of life." The agency has taken about a dozen young people from all over the city to experience Berlin's hip-hop community and is currently raising funds to bring several more 18- to 25-year-olds to Barcelona, Spain in April. "It really expands their horizon and motivates them to work hard to get a similar opportunity," said Travel Agency of Change co-founder Fabian "Farbeon" Saucedo. "They can teach others around them the world is bigger than their neighborhood." 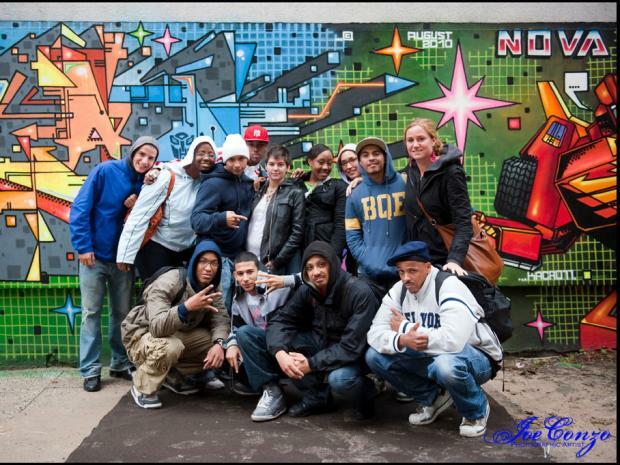 Travel Agency of Change has been partnering with German organization Gangway Beatz since 2009 to create the trips, known as the Bronx Berlin Connection. So far, two trips have given some of New York's young people their first experiences abroad. "You can have people rapping in different languages, but no one misses a beat," said Saucedo, of some of the performances and workshops held on the trips. "It is a new form of cultural diplomacy." The trips cost about $25,000 for a group of up to 10 young people, covered completely by Gangway Beatz and Travel Agency of Change, which fundraises through sites like Indiegogo. Among the stops on the trip was the Berlin Wall, where Livingston put her hand against the historic graffiti-covered relic. "It was like seeing a Picasso painting," she said of standing before the famous structure. While Livingston doesn't rap, she's interested in other aspects of hip-hop culture, like street art and graffiti. "The art here is amazing," she said. The experience led her to change her major at Hostos Community College from liberal arts, a more generic major that was popular with her friends, to digital design. "I am more adventurous," said Livingston of the trip's impact. "I want to do so many more things because I know it is possible." Saucedo, who worked as an education consultant integrating art into the city's school system, is himself a hip-hop artist, poet and teacher. He founded the Hip Hop Re:Education Project — the umbrella group for Travel Agency of Change that uses the La MaMa theater on East Fourth Street as a base — in 2005 to teach the art of hip-hop to young people in schools and community organizations. After recording five independent hip-hop albums and touring the world, he stumbled on Gangway in Berlin while performing. The connection gave Saucedo the idea to use a cultural exchange to give the young people he worked with the trip of a lifetime. "One young person I worked with said none of his friends leave even the state unless they are going to jail," he noted. Mike "Dizturbance" Reyes, a 23-year-old born and raised in Bushwick, Brooklyn, just sent his passport application off in preparation for a trip to Barcelona through the program. "My house was really a stressful place, and it was hard for me to get to school," said Reyes of life before he became involved with the Re:Education Project and fell in love with hip-hop several years before. "I needed something to keep me from going insane. I found an outlet to write about my thoughts and tell my stories," he said. This will be Reyes' first overseas trip after having the lifelong dream of traveling abroad. "It will allow me to meet new people," he said. "It will allow me to grow and give me more experiences to write about."